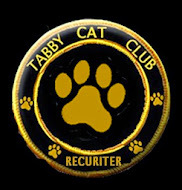 JUST A NOTE TO SAY THAT WE'RE OVER CELEBRATING TOCKTOBER AT THE TABBY CAT CLUB TODAY! OH YEAH, AND DON'T MISS OUR POST BELOW, IT'S IMPORTANT! You guys are so sweet to host good causes!